Idrobenne offers a complete line of buckets to equip earth-moving machinery, from truck cranes to large tracked excavators. 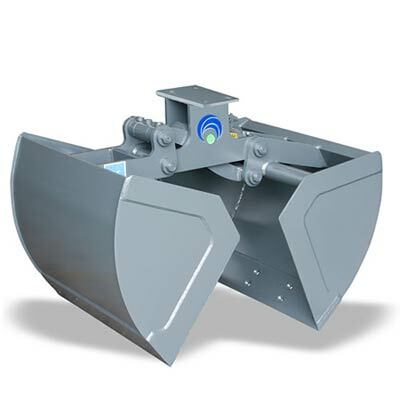 Clamshell buckets are suitable for digging and loading soil, sand and similar materials. 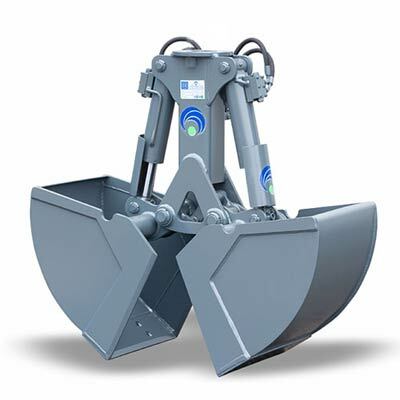 Clamshell bucket with two vertical cylinders for digging. Idrobenne hydraulic attachments are entirely made of high-tensile steel Weldox or Domex for structural parts, and of wear-resistant steel Hardox HB400 in the parts that come into contact with the handled materials, such as the tips of the polyps and the wear blades of digging grabs. All the pins are made of stainless steel; bushes are case hardened. All hydraulic cylinders are generously dimensioned and provided with a safety valve, to ensure a firm grip and to avoid any accident. Heavy-duty equipment, like PV orange peel grapples, mount cylinders with hydraulic cushioning. Most of Idrobenne hydraulic equipment comes with a well-protected hydraulic circuit: flexible pipes are protected by the outer structure and are coated, to prevent breakages in contact with the materials. The prices are very competitive in relation to the sturdiness and reliability of the tools. Idrobenne works with ISO 9001 quality certification; it offers a comprehensive after-sales service and has all spare parts available on stock for immediate delivery. 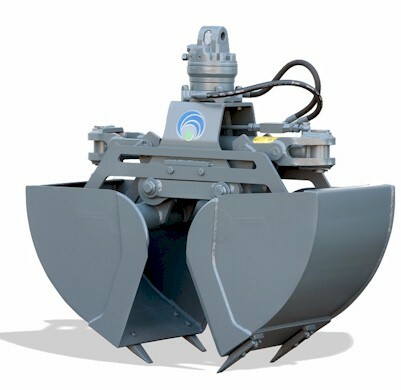 Clamshell buckets and hydraulic clamps can be offered with a comprehensive range of accessories, which can increase their versatility. A tool with a proper optional can be more efficient and effective for a specific application. 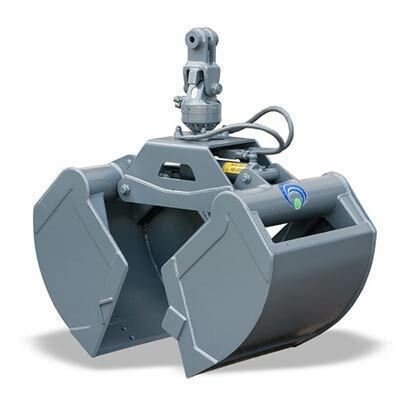 The most common accessories for clamshell buckets are hydraulic rotators. But Idrobenne can also provide special adapters, free rotation devices, bolt-on digging teeth, replaceable cutting edges, suspension links, brackets and adapters for all types of hydraulic quick couplers. 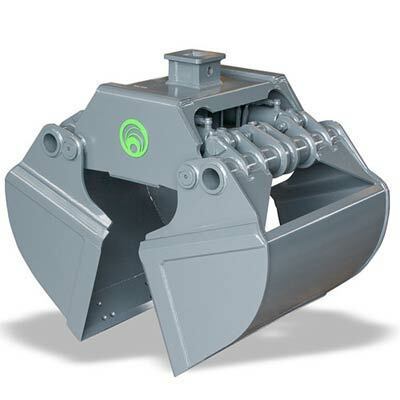 Clamshell buckets, orange peel grapples and log grapples are generally mounted through a cardan link, which allows the tool to swing in the 4 directions with respect to the arm of the machine (that’s the so-called “pendulum mounting”). Idrobenne offers tailor-made links for any crane or excavator. 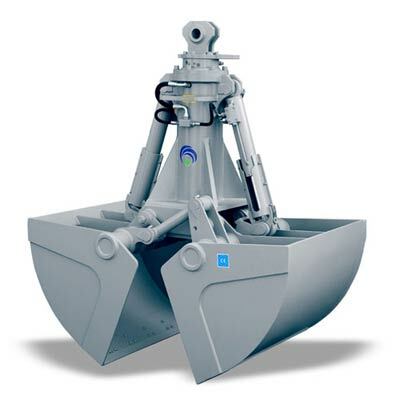 On demand, the Company can also supply equipment with a special treatment to allow the grapple for marine use (salt water is a very hard environment and requires some special features). Idrobenne’s hydraulic grapples are offered in a incredible variety of models. They are so robust that they can be mounted on almost any construction equipment: crawler excavators, mini excavators, wheeled loaders, stationary cranes and truck cranes. It is not hard to find a pre-owned bucket in good condition, given the quality of materials and the reliability of the design. The company based in Isorella (Brescia) has usually some buckets in stock, together with the most important spare parts. A second-hand bucket is always a good deal if in good condition. We must not forget that today the hire of hydraulic equipment is more and more common. Renting an hydraulic tool allows a better control of costs and can help to recover the initial investment very quickly. Do not hesitate to take contact with Idrobenne to receive more information on rental, used equipment and special tools.